MommyDoc: The Health Care Policy Podcast with David Introcaso. 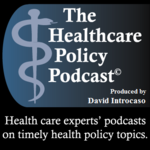 The Health Care Policy Podcast with David Introcaso. This week, I am sharing a podcast with David Introcaso. He invited me on the show after reading a piece of mine written in support of the National Walkout on March 14, 2018. We covered some great material about what I believe physicians should be doing about gun violence. I do hope you enjoy listening.